Why do you think Mary was “greatly troubled” by the angel’s words: “Greetings, you who are highly favored! The Lord is with you”? Have you ever been fearful about hearing the Lord’s voice or receiving a calling from him? What do you think caused that fear? What emotion is stirred when you read the words: “he will reign over Jacob’s descendants forever; his kingdom will never end”? If it doesn’t stir any emotion, why do you think that is? 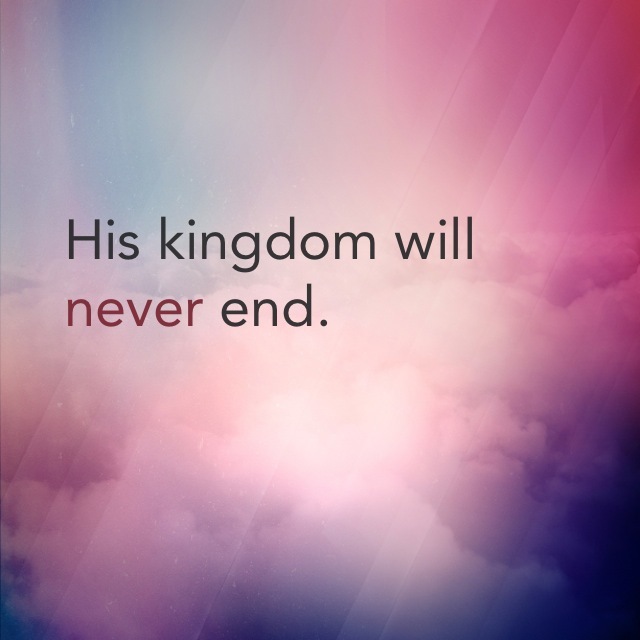 Father in heaven, thank you for Jesus, the king whose reign will never end. Thank you that I can place my hope in you and that although everything around me changes, shifts, and fades, you stay the same and your kingdom will never end. Give me courage, Father, when you call me to action. I want to be a person who says yes to you without delay, without hesitation, and without fear.